Something caught my eye about this section of fence while I was walking today. Maybe it’s the angle of the wood, the shadows from the trees behind it, or the fact that the post is still standing even though the rails are falling down. 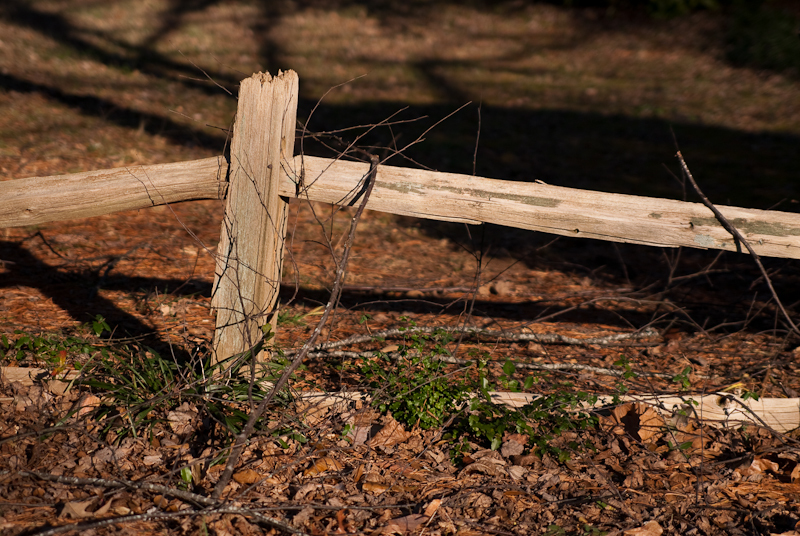 That reminds me that we all have fence posts in life. The rails represent our journey through life and the post would be something or someone the changes the path or supports us as we go. As we start a new year, think back to the posts in your life that brought you to where you are now, and look forward to new ones in the future. Happy New Year everyone! I’ve also decided to add a photography tip to my post; hopefully I can have a tip a day for all of 2010. Photography Tip: Take a camera with you everywhere. If you see a subject that would make a good photograph, it does not really do you any good if you don’t have a camera with you.